(1) Before use, choose the appropriate "gag" to install according to the size and shape of the blocked pipe diameter. (2) After installing the "gag", you can start to inflate the air reservoir. (3) The "gag" is tightly pressed against the water outlet to make it tightly closed. At this time, the trigger is quickly pulled and the airflow is blown. The blockage in the pipeline should be pushed along. *.The gas outlet of the gag must be immersed in the fluid medium that is blocked, so that the effect will be obvious. *.If the pipeline is not blocked, it is recommended to put some soft debris in order to make the pipeline close to full blockage. *.Before the shot is fired, cover the water in the toilet mouth with a plastic towel or something to avoid splashing yourself. *.If there are multiple overflow outlets in the pool or downpipe, please ensure the tightness of other overflow outlets before work. *.It is recommended to whip 15 - 25 times until the pressure is maintained. *.This product is a pneumatic tool, please stay away from children and do not disassemble. Why is it cleaning so fast? : Use the power of high-pressure compressed air to wash away the worst plugs in seconds. Just take the drain impactor and squeeze the trigger to remove the blockage immediately. It is much faster than traditional plungers and snakes, and does not leave more time on the drain. 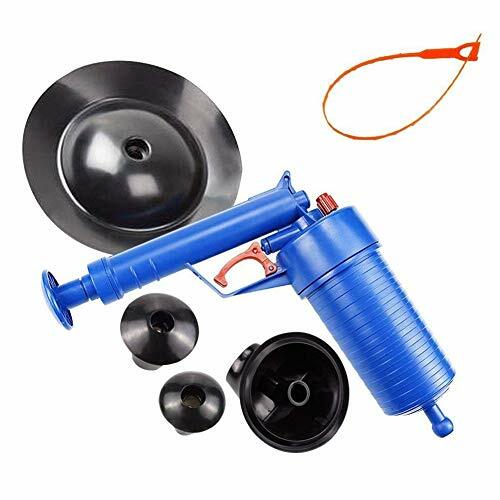 MEET ALL YOU NEED : Comes with 4 sized suckers, the Toilet Plunger Blaster can be used for toilet, washbasin, bathtubs, shower, sink, squatting pan, floor drain, blocked pipes. Efficient Cleaning Capability : The air reservoir diameter is up to 8cm, the air storage capacity is large, the pressure is high, the air pressure is high pressure, the pressure of the high pressure air is used to wash away the worst plugs in a few seconds and can be processed by the hair , Cloth, tea, grease, oil and other various clogging caused by garbage. Together with our small gift Sink drain cleaning hook to clean the drain quickly and easily. Unique Design: It has unique safety valve and double protection, making it easier to clear. The humanized design of the thread lengthens the push-pull rod design, increases the single intake air volume, and also has a trigger type design. The operation is simple and time-saving is convenient. Environmental Protection And Durability: Using ABS engineering plastics, durable, natural materials, non-toxic harmless, will not corrode your pipeline or endanger your family health. If you have any questions about this product by PartLove, contact us by completing and submitting the form below. If you are looking for a specif part number, please include it with your message.